CD review: "In Good Company"
This review first appeared in the September 11, 1992 issue of the North County Blade-Citizen (now North County Times). 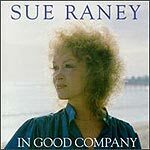 Jazz vocalist Sue Raney is finally, after a generation garnering enthusiastic critical notices, coming to the attention of the listening public. Last month (August 1992), KPBS-TV (San Diego) taped Raney for its "Club Date" series (it should be seen on most PBS stations this winter) backed by the all-star trio of Bob Magnusson (bass), Jim Plank (drums) and Mike Wofford (piano). Raney's new release, "In Good Company," should also do much in furthering her name recognition and audience growth. Backed by a tight combo featuring trumpeter Conte Candoli and trombonist Bill Watrous, Raney is in her element here: sophisticated, brassy arrangements of standards ("Mood Indigo," "I'm Gettin' Sentimental Over You," "The Man I Love," etc.) which lend themselves to the type of honest, intelligent, improvisational treatment Raney gives them.